Microsoft is running a campaign called Windows Phone Next App Star, and guess what? Over 9,000 apps entered the competition, and my app Jack of Tools Pro is one of 16 finalists in round 3! Starting today, March 26, my app is in a head-to-head battle with another finalist. If my app gets the most votes, it keeps moving forward, and I keep winning more prizes. If my app wins the whole thing, Jack of Tools Pro will be Windows Phone Next App Star and will be featured in an upcoming Windows Phone television ad! Even better, every time people like you participate in the campaign and vote, they are entered to win a brand new Lumia 920 Windows Phone! Microsoft is giving away one Lumia 920 every day throughout the contest, and every vote is an entry. 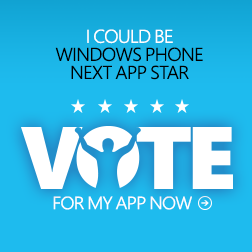 Will you please help me become Windows Phone Next App Star? PLEASE VOTE FOR MY APP! Please note: You may have to vote several times before reaching the voting opportunity for my app. There are 8 third round match-ups, just look for a picture of me and my app Jack of Tools Pro.